Abstract — PlastiComp’s Pushtrusion™ direct in-line long fiber thermoplastic (D-LFT) compounding process provides processors of fiber-reinforced thermoplastics a simple and affordable alternative to pre-compounded pellets and GMT sheet, while yielding materials with equivalent or slightly higher mechanical properties. Its clever and uncomplicated design allows PlastiComp’s D-LFT unit to easily mount on top of injection molding machinery of various sizes to compound both long and short fiber reinforced thermoplastics. Also, the unit can be used as a stand-alone device to compound hot charges of material that can be compression molded into parts replacing GMT sheet. The opportunity to compound fiber-reinforced thermoplastics in-house allows processors and converters to capture a greater portion of the value chain. The flexibility of the technology does not favor a particular thermoplastic or fiber formulation and therefore allows compound customization using any combination of commercially available raw materials. Figure 1: D-LFT Process Schematic. In the D-LFT process (Figure 1), neat thermoplastic resin pellets are fed into the hopper of the polymer injection unit. The injector unit is a typical injection barrel, capable of melting resin and homogeneously mixing and introducing the melt into the process at high rates and pressures. Continuous glass fiber roving is pulled from supply creels into the process die by the high-pressure flow of molten resin. The viscous entrainment die is designed to meter glass fiber and molten resin, keeping the glass fiber percentage within close tolerances. The glass fiber strand and molten resin mixture is pushed from the viscous entrainment die at speeds up to several hundred feet per minute. The process can start and stop instantaneously or run continuously, as dictated by material output requirements. An in-line chopper cuts the glass fiber imbedded in the molten thermoplastic resin as it exits the viscous entrainment die. The chopper’s cutting chamber is heated to maintain the cut mixture in a molten state. The resin and cut fiber mixture is then directed through a transition tube positioned directly above the injection molding press screw. Fiber chop lengths of 1/4 inch (6 mm) through several inches (50 mm) are possible. The D-LFT process is capable of controlling glass fiber percentages within a narrow range. A total variation of less than +/-2% by weight is typical. The significant advantage of PlastiComp’s D-LFT process over other D-LFT technologies is the ability to control fiber length. The patented chopper design allows fibers to be cut to a specified length. Other D-LFT technologies use twin screws to chop the fiber, which leaves fiber length up to random distribution. 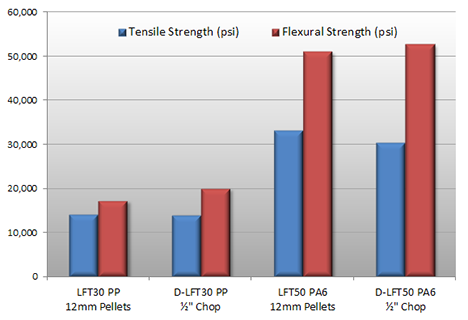 To correlate properties between LFT pellets and D-LFT technology, a comparison of mechanical properties was performed using formulations of 30% long glass fiber reinforced polypropylene pellets with 1.04% of a proprietary coupling agent and 50% long glass fiber reinforced nylon 6 (polyamide 6) pellets. 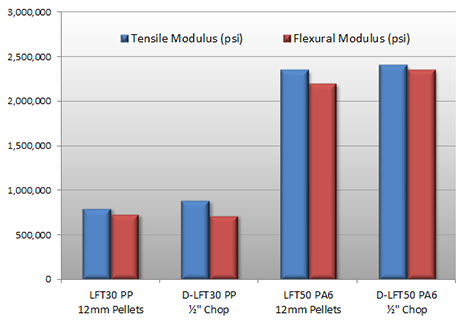 Figures 2 through 4 compare the data that was generated from pre-compounded LFT pellets manufactured via industry standard pultrusion methods and using PlastiComp’s D-LFT equipment. The test bars were molded using the same mold, same injection machine, same formulation, and same initial 1/2 inch (12 mm) fiber length. Figure 2: Tensile and Flexural Strength. Figure 3: Tensile and Flexural Modulus. 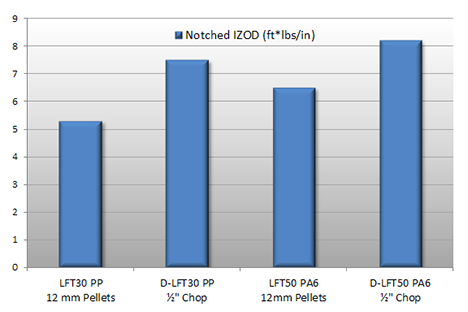 Figure 4: Notched IZOD Impact Strength. The data suggests that the D-LFT compounds yielded higher properties. This is especially evident in the Notched Izod Impact properties where a 40% increase was found. It is important to understand the possible reasons for this when the compounds and processing conditions were identical. The D-LFT compound has only one heat history, compared to two for LFT pellets. An ash test of the materials was performed and it was found that the D-LFT material produced had an actual fiber content of 32% by weight compared to 30% by weight for the test bars produced from LFT pellets. This would account for some of the increase in properties seen in the D-LFT materials, but one would expect a property increase across the board (tensile, flexural, and impact) if the slightly higher fiber content was the determining factor. Since the largest gain was seen in impact strength, it can be assumed that longer fibers were retained in the test bars molded with material from the D-LFT process. The D-LFT compounds are never cooled and are introduced to the injection screw in an already molten state. No shear is needed to melt the material in D-LFT processing. This results in less fiber breakage than typically occurs when molding LFT pellets. LFT pellets are typically chopped at a length no longer than 1/2 inch (12 mm). This is to prevent bridging problems in the hopper of injection molding machinery. The D-LFT system delivers its chopped compound to the injection machine in a molten state right to the injection screw, so the fiber length could be up to 2 inches (50 mm) long and not cause any feeding issues. Fiber length becomes a more critical issue when molding larger parts on higher tonnage injection presses as fiber length retention will be greater on larger machines that have larger screw flights and larger mold gating. This should result in an even greater property increase for D-LFT materials. The D-GMT™ process was used to create 34% glass fiber (by weight) polypropylene charges which were pressed in a 200 ton Wabash compression press to make 7″ x 7″ x 1/8″ (18 cm x 18 cm x 0.3 cm) thick plaques. Mechanical test bar specimens were water jet cut from the plaques and the bars were tested for mechanical properties. The properties of these materials were compared to the mechanical properties of 32% (by weight) polypropylene GMT sheet as shown in Figure 5 below. Figure 5: Properties of D-GMT versus GMT Sheet. The properties of the material produced by the D-LFT unit meet or exceed the properties of the GMT sheet used in the comparison. It is important to note that the properties of the material produced using the D-LFT process can be influenced by the placement of the charge within the mold. Figure 5 shows the influence on properties that material placement in the mold can have. By placing the charge of material at the edge of the 7″ x 7″ (18 cm x 18 cm) mold, the properties of the part were increased by approximately 30% or more when compared to properties of a part that had the charge placed in the center of the mold. This increase is due mainly to increased fiber orientation. This orientation effect provides processors with a level of control that is not possible when purchasing GMT sheet. In order to stay competitive in today’s global market, cost reduction is a key factor. Raw materials are typically the largest cost component of plastic part production. This is where D-LFT has a large advantage over pre-compounded LFT pellets. A material processor can typically save up to 30% in raw material costs when using D-LFT technology instead of LFT pellets. The savings can be even greater when employing this technology with higher cost engineering thermoplastics such as nylons (polyamides) or thermoplastic polyurethane (TPU). Where PlastiComp’s D-LFT system separates itself from other D-LFT technologies is with its size — its compact construction allows for the unit to be mounted on top of an existing injection machine, minimizing the need for additional floor space — and its price. PlastiComp’s D-LFT system can also be by-passed or removed when not in use so that a molder can process neat or other pre-compounded thermoplastics if needed. This increased flexibility reduces the risk of having underutilized, dedicated molding machinery assets on the production floor. The D-LFT unit can be retrofitted to an existing injection molding machine, or an entirely new system can be purchased. With the large material costs savings that a D-LFT system provides, the return on investment (ROI) for this equipment is quite rapid. Figure 6 shows a payback scenario based on a retrofit unit. 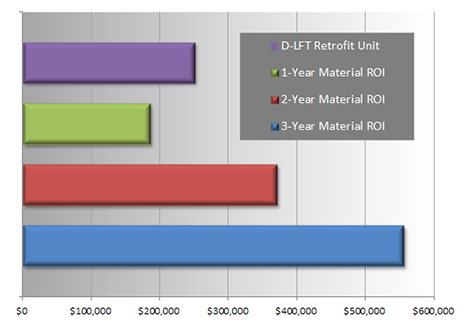 Figure 6: PlastiComp’s D-LFT Retrofit Unit ROI. Many competitive D-LFT technologies on the market are three to four times the cost of PlastiComp’s D-LFT system. In order to get a suitable ROI on a competitive unit, a processor must have a very large volume OEM for which they are molding long fiber reinforced parts. High cost and volume factors have, until now, limited installations of D-LFT technology in the marketplace. Since competitive units are only capable of processing D-LFT materials, there is significant capital put at risk if key production jobs are shifted. PlastiComp’s D-LFT system reduces the expense and risk to the molder, by offering a lower cost, flexible alternative. PlastiComp’s D-LFT technology has the opportunity to disrupt the compounding industry by offering an affordable alternative to current D-LFT equipment options. The ability to be able to remove or bypass the D-LFT unit and use the injection machine to mold unmodified thermoplastics greatly reduces idle equipment risk for molders. Cost savings obtainable through lower raw materials costs can be greater than 30% of LFT pellet prices. D-LFT technology is able to produce materials that yields mechanical properties equal to or greater than those of LFT pellets and GMT sheet.